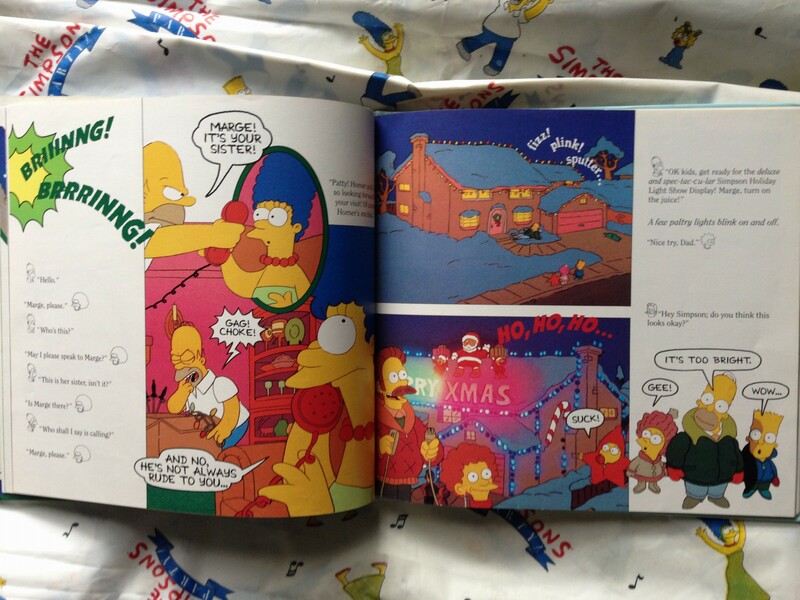 The Simpsons Xmas Book is a hardcover picture book, retelling the very first episode, “Simpsons Roasting On An Open Fire.” It’s pretty damn lovely. 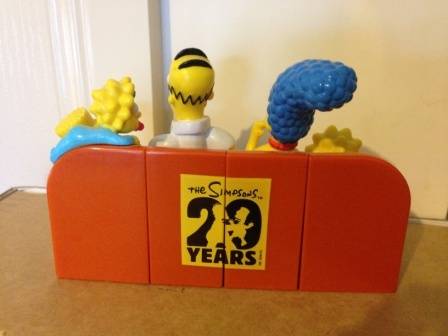 The Simpsons Stick ’ems are weird little rubber figures with suction cups on the back, released in September 2009 to celebrate the show’s 20th anniversary. 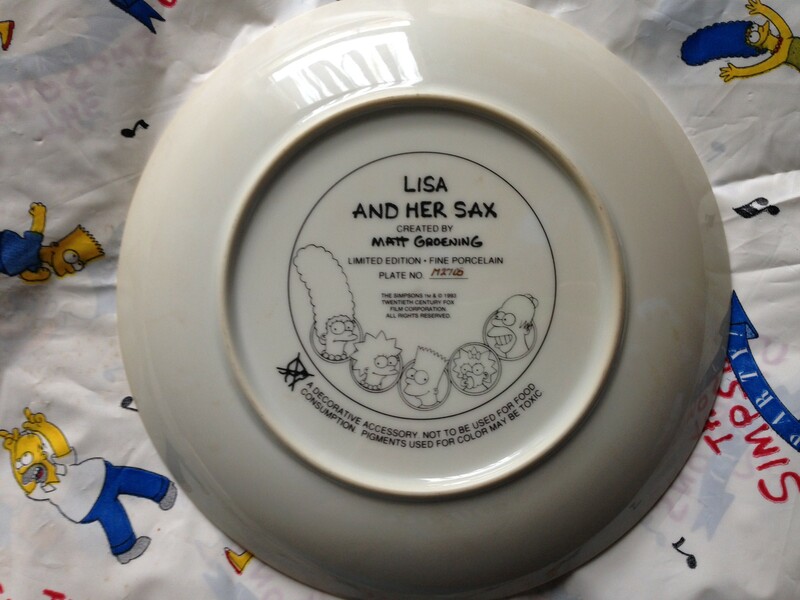 They could apparently be used to play some half-assed Jacks-style game, but I doubt anybody ever did. One was available each day for sixteen days with the purchase of an Overlord Murdoch – I mean, News Corp Australia – newspaper. That’s the Herald Sun in Victoria, The Courier-Mail in Queensland, etc. 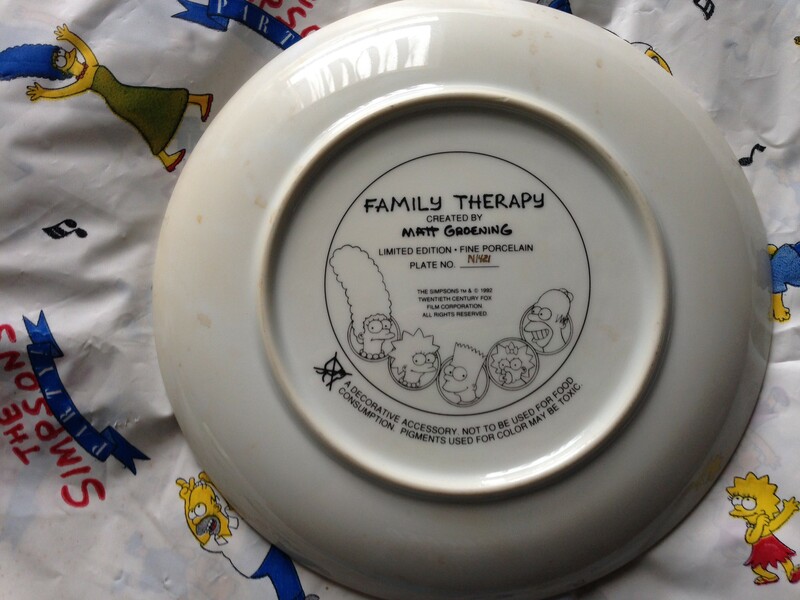 I’m not sure if they were ever available outside Australia. 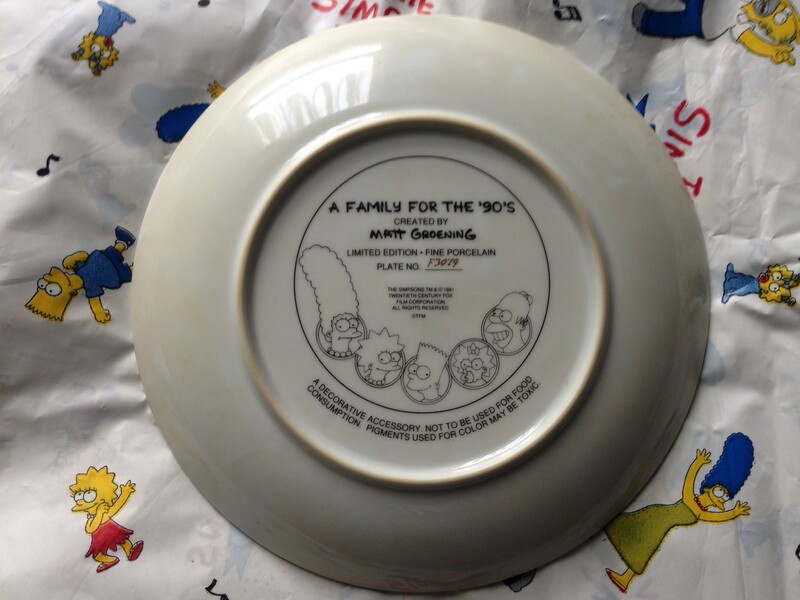 Along with the basic set (pictured above), there were also rare, special edition versions of each: the six family members (including Grampa) came in a pseudo-gold variant, while the other ten had glow-in-the-dark versions. 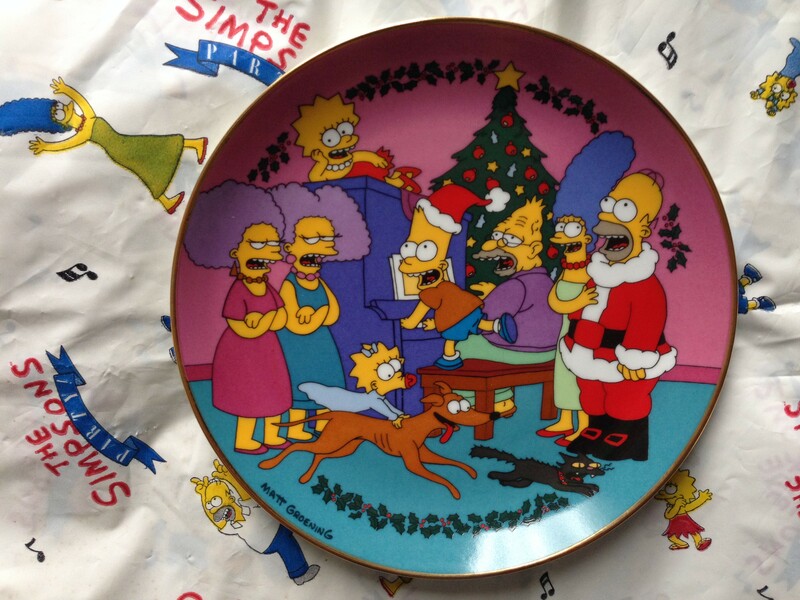 Those are pictured below, but I’m still missing a few of them. 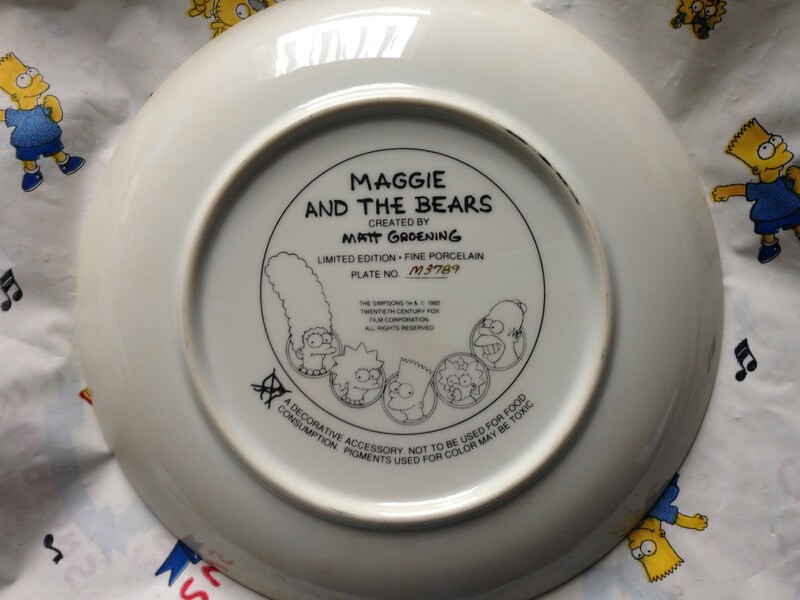 Set: 6 These plates are too beautiful to ever eat off of, and it’s a good thing too, since a note on the back warns that “pigments used for color may be toxic.” Not that anyone would risk scratching or staining these beauties, anyway. 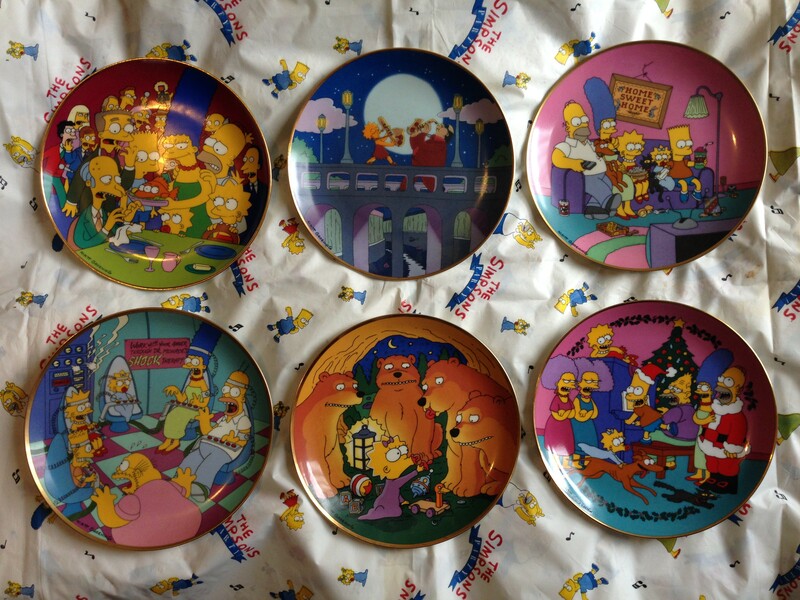 This set of six Franklin Mint collector plates was available in the early ’90s, primarily through mail order – there are ads for them in The Simpsons Illustrated magazine series. 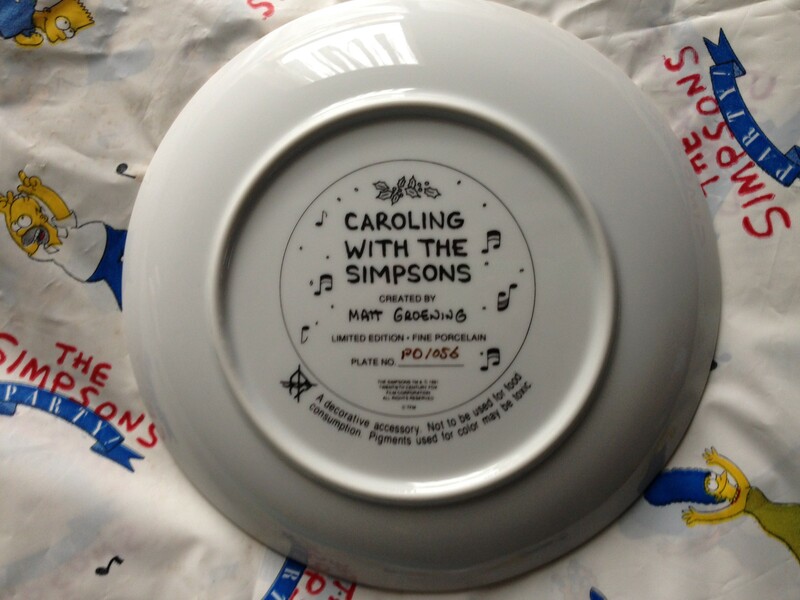 Each one comes with a certificate of authenticity stating that it “is crafted of fine porcelain, and is bordered and individually hand-numbered in 24 karat gold.” I have the full set of six plates, but unfortunately, I’m missing the certificate for “Caroling with The Simpsons.” Released in 1991, the first in the set depicts Our Favourite Family in one of the most commonly recurring locations: on the couch, in front of the TV. 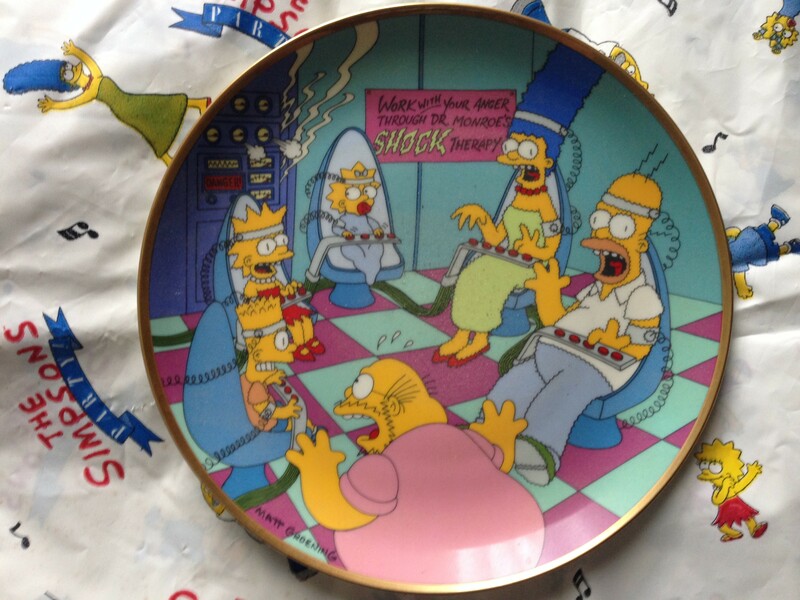 It’s the only plate in the set which doesn’t feature a specific scene, but rather a commonly-used stock image. 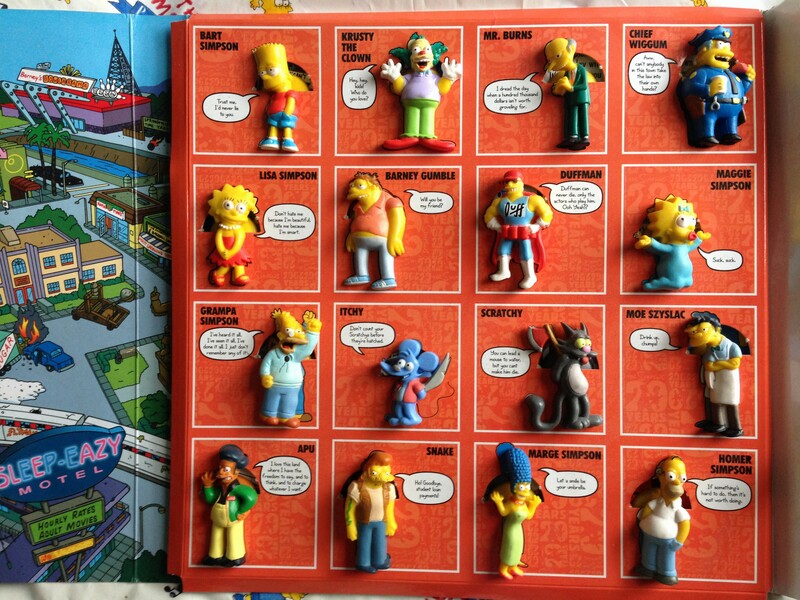 It proves The Simpsons truly are a “A Family For The ’90s” (and the ’00s. And the ’10s. 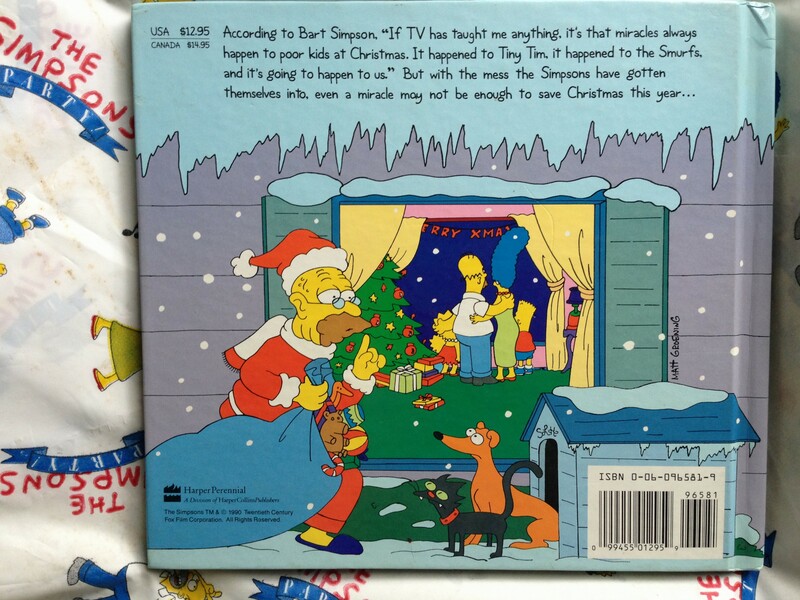 And…) Also released in 1991, “Caroling With The Simpsons” captures the classic family shot from the very first episode, “Simpsons Roasting On An Open Fire.” Released in ’92, “Family Therapy” shows the Simpsons in Dr Marvin Monroe’s electroshock therapy session, from the season one episode, “There’s No Disgrace Like Home”. 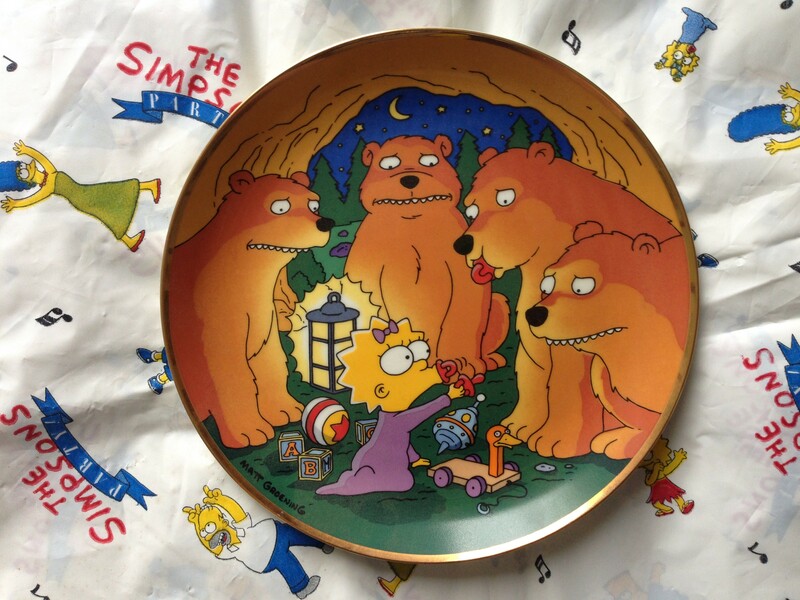 Also out in ’92, “Maggie and the Bears” shows a scene straight out of the classic “Call Of The Simpsons” episode, where the family get stranded in the woods. 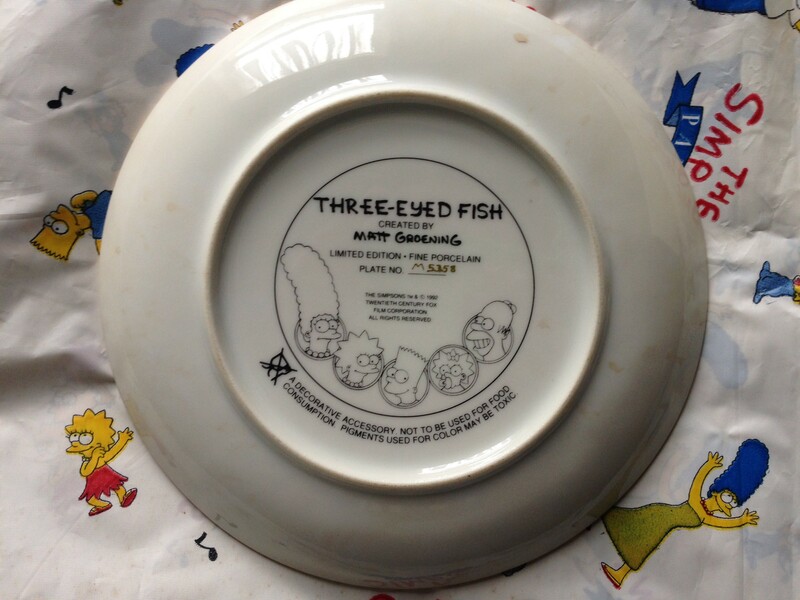 The unimaginatively-named “Three-Eyed Fish” plate captures the moment Mr Burns’ political career went belly up, as Marge and the family serve Blinky for dinner, in the second season episode, “Two Cars In Every Garage And Three Eyes On Every Fish.” Only slightly-more-creatively-named, “Lisa And Her Sax” rounded out the Franklin Mint’s Simpsons collector plate set. 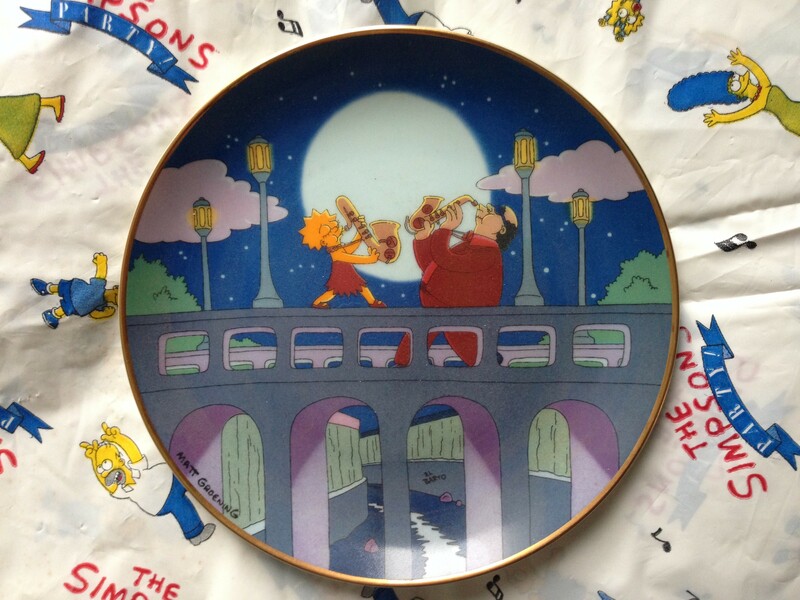 Released in 1993, it shows Lisa and her jazz mentor, Bleeding Gums Murphy, jamming out on the bridge, as seen in the iconic episode, “Moaning Lisa”. 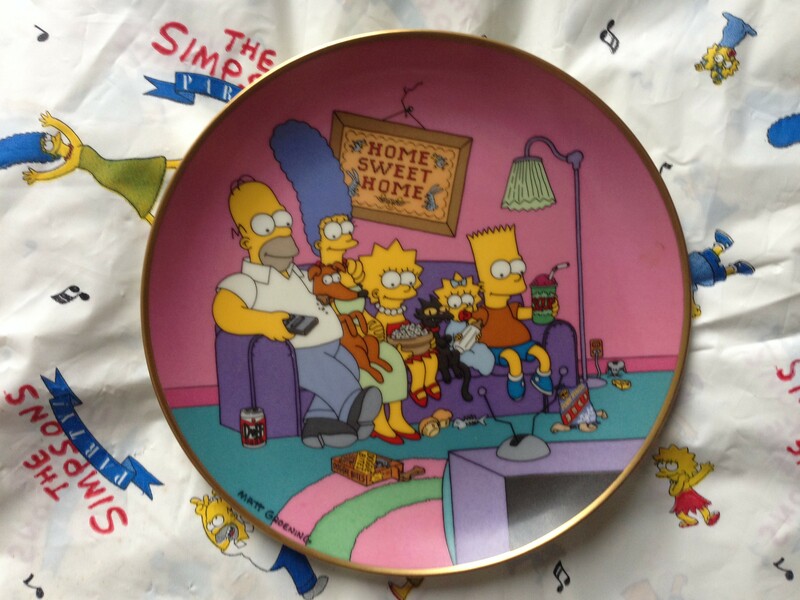 This four-piece snap-together couch set came in Hungry Jack’s in 2009, to celebrate The Simpsons 20th anniversary. 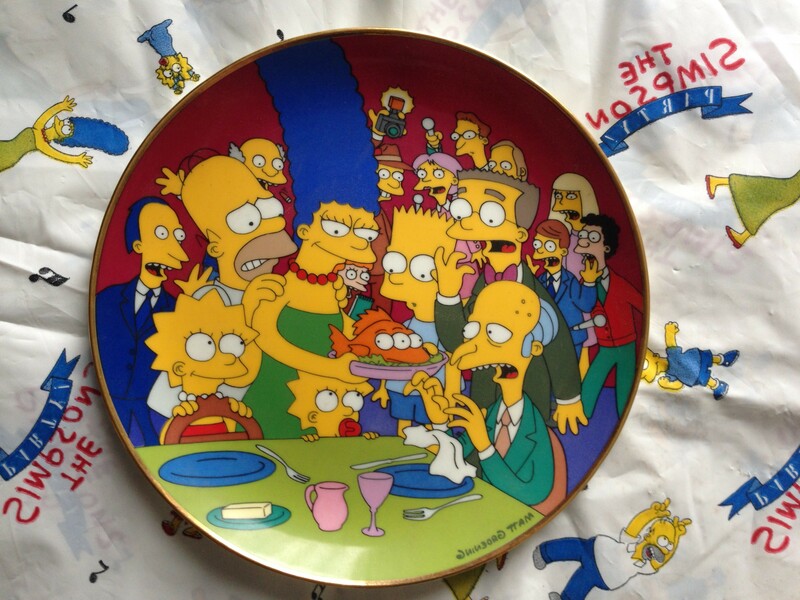 One piece was available in Kids Meals each week for four weeks, and all together it looks pretty damn nice. 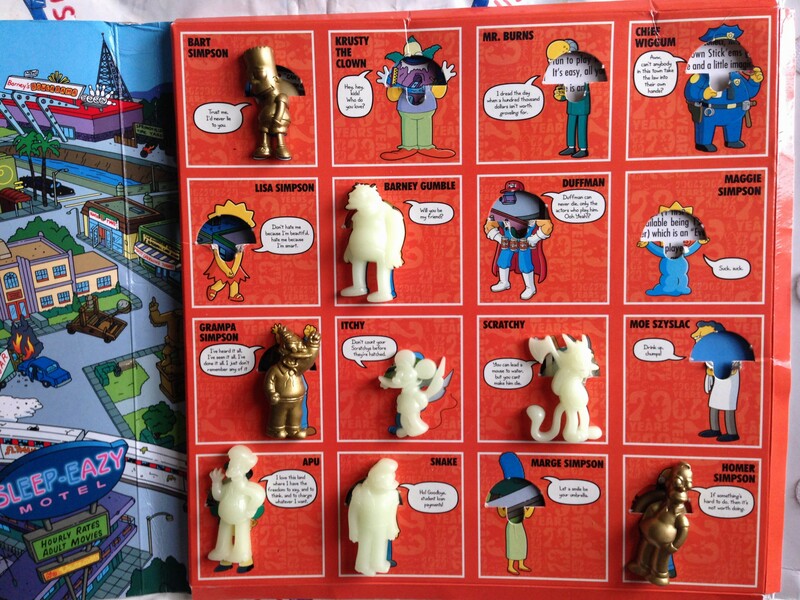 Since Hungry Jacks is the Australian equivalent of Burger King (the different name is due to a trademark issue back in the 1970s, apparently), this set might have been released in Burger Kings in other countries, but I can’t find any record of it. 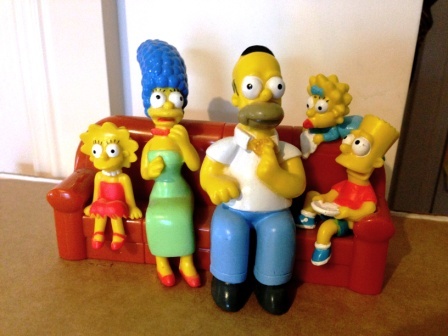 These are Simpsons Bubblegum heads from Sweet Ring Imports, and I kinda love them. 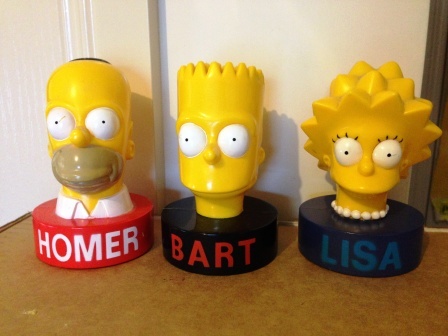 I mean, they’re nothing too special: hollow plastic figures of Homer, Bart and Lisa’s heads, with their names on the bases in case you’re not from this planet and don’t know who’s who. 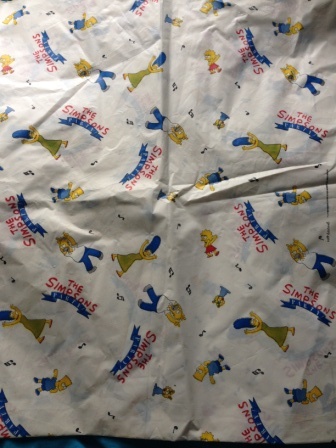 And the fact that they’re full of gum is a nice bonus (even if it’s almost 20 years old and slightly less edible than it was when new). 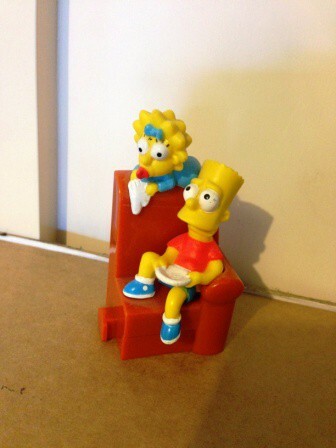 No, the thing I love about them is those eyes. 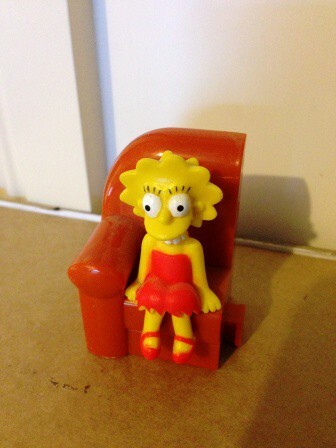 Everyone’s pupils are just a little too small, and it gives them a vacant, creepy stare that will consume your soul if you look at them for too long. 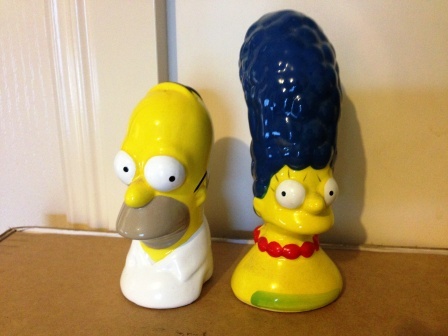 This pair of ceramic Homer and Marge salt and pepper shakers is too fragile for my clumsy hands to ever actually use, but damn they look nice on a shelf. 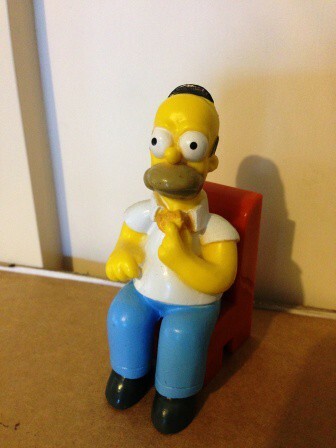 Released in the UK by Lions Brush in 2000, Homer stands at 9cm, and has five holes in his head, while Marge towers over him at 12cm, but has just one hole in the top. So which one’s for salt and which is for pepper? That question keeps me up at night.